SMGS Partners with the CoMELEC for Biometrics Registration. In line with the Commission on Election's campaign for "No Bio, No Boto", SM Supermalls has partnered with the agency in providing accessible and convenient venue for the Biometric registration. Come Halalan 2016, voters whose biometrics have not been captured will not be allowed to cast their votes. 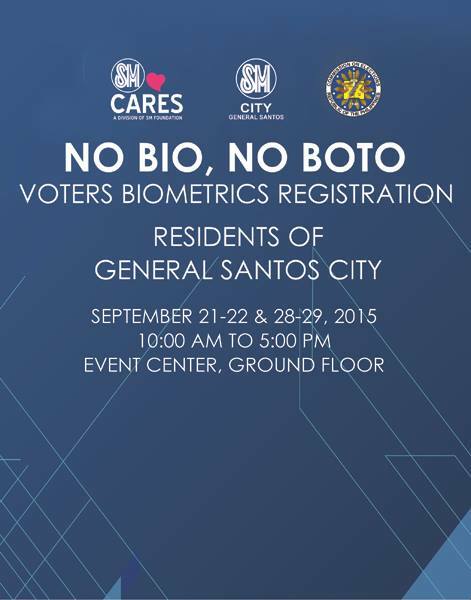 In General Santos City, September 21-22 & September 28-29, 2015 have been slated to cater applicants for biometric registration at The Event center of SM General Santos. Applicants are required to bring a photocopy of any government-issued ID or a photocopy of Birth Certificate. Voters are also encouraged to have their biometrics validated to avoid inconvenience come election day. Biometrics registration will end on 31 October 2015.